Two frogs were happily hopping around when they saw a big pail sitting in front of them. They both were so interested that they couldn’t control themselves – they decided to jump up onto the rocks around them to see if they could find out what was inside the bucket. When they couldn’t see from that vantage point, they decided to jump in together, splashing into a pail full of cream. At first they were thrilled and drank until they could drink no longer…and then they realized that they couldn’t get out. Each time they jumped, they hit up against the slippery side of the bucket and fell back in. They kept trying and trying, until the bigger one said, “I can do this no longer. I’m too tired.” He gave up and drowned in the bucket. The little frog told himself, “I’d rather die trying to get out of here than just give up and sink to the bottom.” He continued to paddle and paddle and then he’d try to jump, only to hit the side and slip down again. This went on for some time, until as he was paddling, he felt something solid under his foot. He stepped onto this solid thing, jumped, and he was out of the bucket! By continuing to paddle, he’d churned the cream into butter, and was able to jump out. Never give up, for we never know when the moment when everything will change will come. This entry was posted in Uncategorized, Words of Wisdom and tagged wisdom, zen. Bookmark the permalink. This is so true. It comes in an instant and when you least expect it. Thank you for stopping in! Now that I am back from my retreat, I hope to write more on my own. So, so, true! When the need is greatest, God’s help is nearest to you! Love your take on this!!! 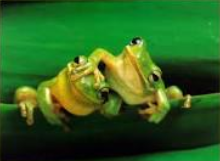 This was the only picture I could find with 2 frogs, and I certainly have no drawing talent to do something with frogs in a bucket. Thanks so much for always taking the time to stop by; I appreciate it more than you know.